The Porsche Boxster is definitely no Grand Tourer. It is not as comfortable on cross country runs as maybe a four door junior executive. It is not as quiet as a coupe cruising down the Autobahn. Visibility to the rear is horrendous. It does, however, have cup holders that reach out from concealed storage in the dash like mechanical arms. 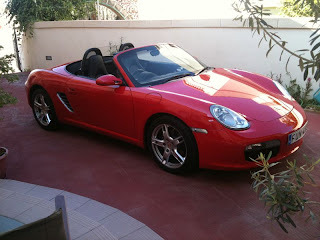 Driving the Boxster all the way from the UK to Malta is where you really enjoy any car. High speed runs on motorways are the real deal, although Mountain passes are where it really gets your attention; this is where this two seated roadster really becomes exhilarating. Leaving Livigno through the picturesque green meadows for a 120KM sprint with the top down, sun shining, White Mountain tops; this is open top driving at its best. Sit down behind the wheel, turn the key & sitting right behind you, a flat 6 cylinder engine ignites into life. The boxer engine is a key element to provide a low centre of gravity, unique in this category. You don’t just hear the engine, you feel it! The injector’s fire up the combustion chambers & the engine sounds angry with a deep yowl as the revs get higher all the way to 7000rpm. A constant surge of acceleration rounds off with an extra lunge from 5000rpm upwards. This particular model, the 2.7 with 240BHP, reaches the 0-100KM dash in 6 seconds dead & goes all the way to 258KM/Hr. But this is not all about speed; it's the handling. The steering is precise & sensitive so you point & it obeys, giving the ability to decode the road through your palms. It always feels planted to the road coming to life the faster you go; inevitably you push harder. The chassis is so good, it just begs for more power. Amazingly, although having such a sharp balance in & out of the corners, even when pressed, the ride stays calm. Once settled down inside, there are no spectacular Gizmos or space travel equipment. No messy buttons scattered all over just like left over litter after a windy day. There are better places to be. In fact, there is nothing really striking about the dash except for the binnacle. That's it, the binnacle, it says it all at first glance; no nonsense, it is completely driver focused. As with all Porsche sports cars, a massive rev counter dominates the centre, flanked by all the information you need. On board computer nestled in the rev counter which also displays speed. the wrist action although has a wonderful throw when deciding which gear & resides in the exact position for spirited driving. There is one button you do need; PSM. Porsche Stability Management is standard throughout the range. When you do get carried away & believe me you will, this keeps you on the road by applying selective braking on individual wheels. There is a certain level of play before the electronic wizardry interferes, just enough for the driver to feel in control before the limit. If brave enough, it can be switched off. This transforms the car’s handling according to the driver’s ability & the amount of juice applied. Once it starts to lose it, back off the power & it stabilizes in an instant. Very exciting on the twisties but better kept in check with PSM on. As with all Porsches, the brakes are excellent. Cross drilled discs front & rear with aluminium monobloc four-piston fixed calipers. Great feel & no abrupt braking at any speed. Obvoiusly accompanied by ABS. So there you have it. It's the standard reference point for what makes a sports car. An all round balance of wonderful handling & performance combined with the practiaclitiy to enjoy as a daily runabout or an outstanding weekend of fun! Many thanks....there are more to come! Great write up. The Boxter is one of my favourites! Thanks Wayne, glad you like it. Just like any new product, the first models to roll off of the line had its share of issues making Porsche Boxster parts a valuable commodity. A used Porsche dealer will help you to find the right parts match with your Porsche year and model number.